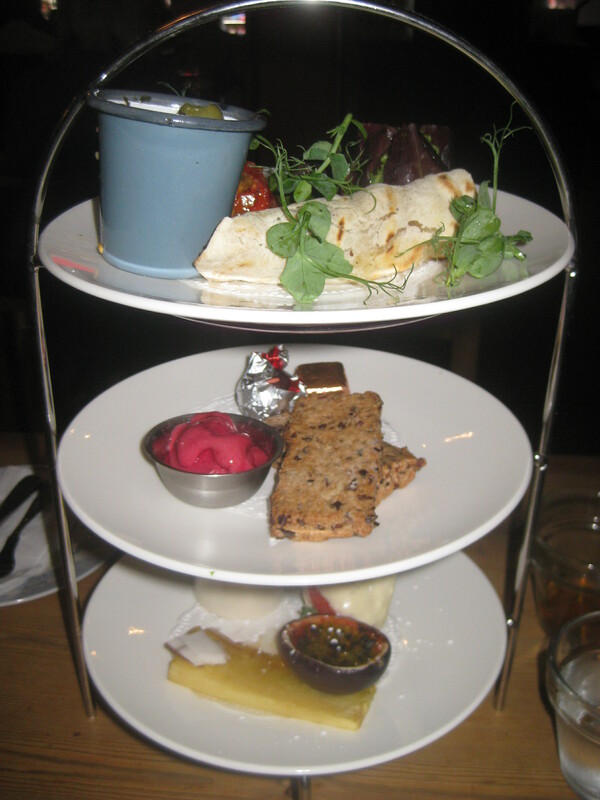 Manchester is proving to be the place for vegan afternoon tea. Google as I may, it seems to be slim pickings out there for other cities. But this is my third in Manchester, and I’m hopeful of finding a few more. Teacup, for non-Mancunians, is a charming little cafe in the Northern Quarter, famed for its colourful and towering layer cakes. Alas, it is not famed for being vegan-friendly: generally speaking, there are no vegan cakes on the menu. However, when I emailed an enquiry, they told me they would be happy to provide vegan afternoon tea, even breaking their own strict no-reservations policy (there’s often a queue out the door). And yet…still no vegan cake. It was an unusual afternoon tea, but I really enjoyed it. Proceedings got off to a pretty poor start, when we waited thirty minutes for our afternoon tea (despite the fact that we’d booked it in advance), and had already drained our teapots. Fortunately we managed to get refills (rose tea is now my favourite accompaniment to afternoon tea, it’s glorious) when the elegant racks of food finally arrived. 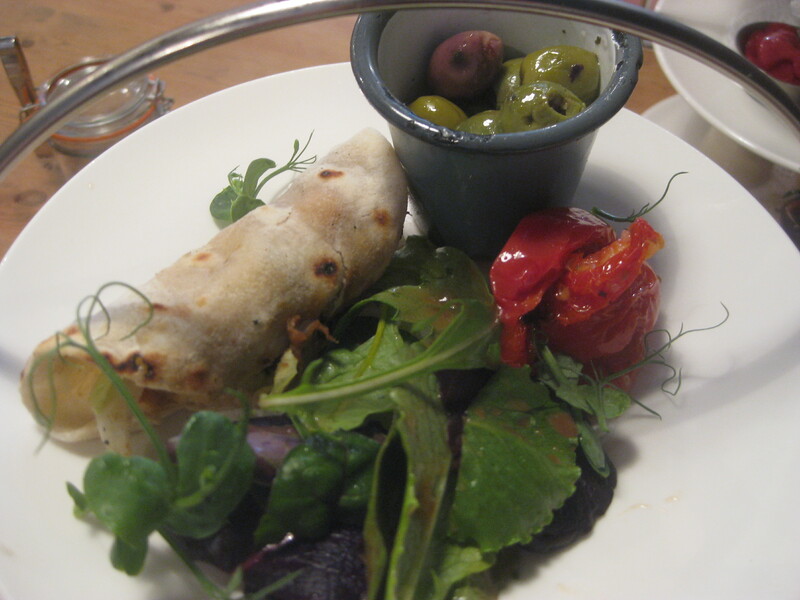 The savoury plate was different from the norm: a delightful falafel wrap (a little on the dry side though, and could have done with a slap of hummus), some nicely seasoned salad leaves, beautiful tomatoes and a little bucket of olives. It was like a normal sandwich dish condensed into finger food, and it was really good. In the absence of scones and cakes, the only baked good was the biscuit. It was almost biscotti-like in its crispness, though the centre was a wee bit softer. The chocolate was dark and rich, and there was a nice touch of spice. I loved them, because I like dry biscuits, but my companions would have preferred just one biscuit alongside another treat. 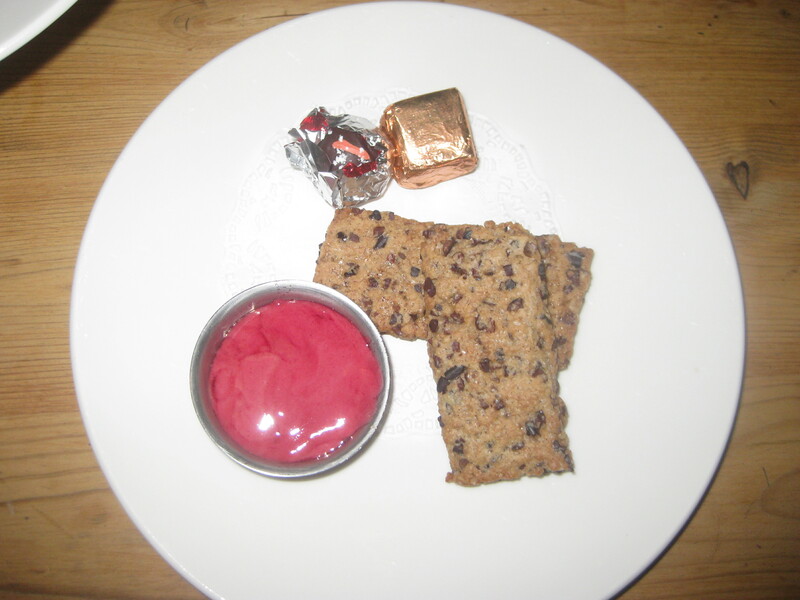 The two biscuits were accompanied by a little pot of raspberry sorbet, which had melted by the time we got to it. There were also two pretty little truffles from BonBon Chocolatier, just around the corner from Teacup. The gold one was described as “rum sozzled”, and that was certainly an accurate description: there was a lot of booze in there! When I first saw there was a fruit plate, my blood began to boil. Fruit?! As part of afternoon tea? But I may have been a little hasty. The pineapple didn’t do much for me – it was sweet and fresh, but not really special. The jug contained a thin yellow drink that had no discernible flavour – we’d been expecting something lemon curd-based, or with tropical mango flavours perhaps, but none of us could identify the taste. 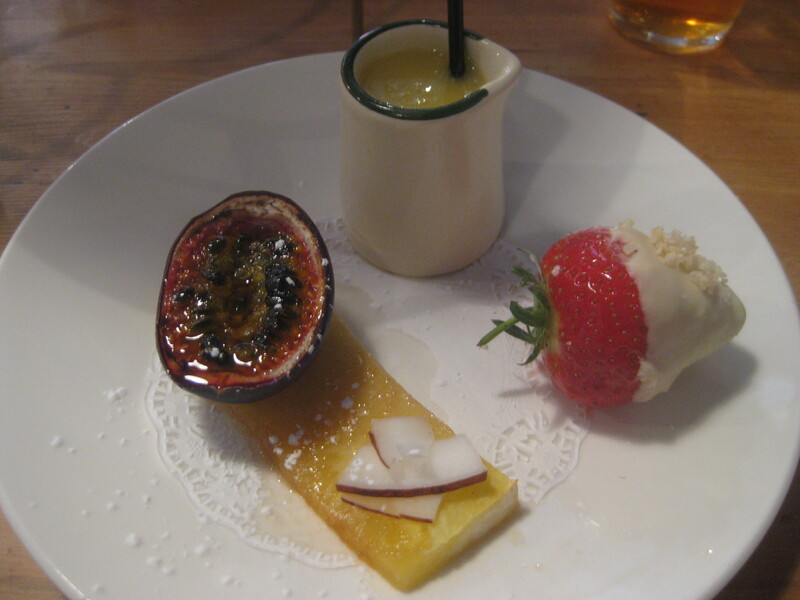 The passionfruit was sublime, but the real star of the show was the strawberry. It was dipped in white chocolate and we could see something crunchy on the outside: nuts, we assumed. Yet as soon as I took a bit, the popping candy started whizzing and fizzing in my mouth. What an unexpected treat! In conclusion, it was a surprising afternoon tea. 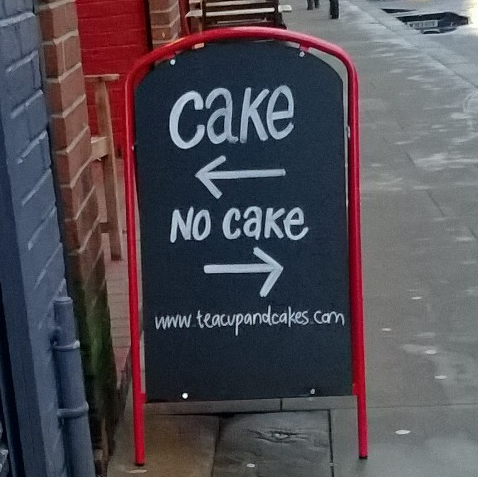 I felt a little disappointed not to have had even a sliver of cake. I feel if a place that’s famous for its spectacular cake promises an afternoon tea, they should at least attempt a vegan cake. It was mostly delicious, and I wasn’t hungry when I left, but nor did I feel that I’d really had what I’d wanted. Is just a little bit of cake too much to ask for? 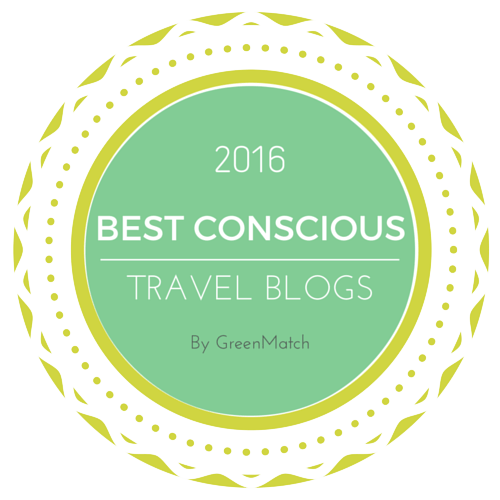 This entry was posted in Afternoon tea, Travel and tagged Teacup Manchester, vegan afternoon tea, vegan Manchester, vegan Teacup. Bookmark the permalink. I would never even have thought of asking in there. Shame about the lack of cake but good to see they’ve put some imagination into it. I would love to support Northern Quarter businesses like Teacup, Home Sweet Home and Sugar Junction more but a apart from a drink there’s little else to buy. I just don’t get why they don’t investigate vegan baking especially as we know it’s actually easily than non- vegan baking. I look forward to seeing where you get to next! I was wondering about Home Sweet Home, I might see if they do anything. I agree about the NQ being a bit disappointing – you’d think they would be primed for a vegan audience. Rose tea sounds great but no cake? Sadness! I would be pretty irritated if somewhere said they could make a vegan afternoon tea and didn’t even manage to whip up a muffin! And the fact that they are famous for their cakes as well! Very disappointing. 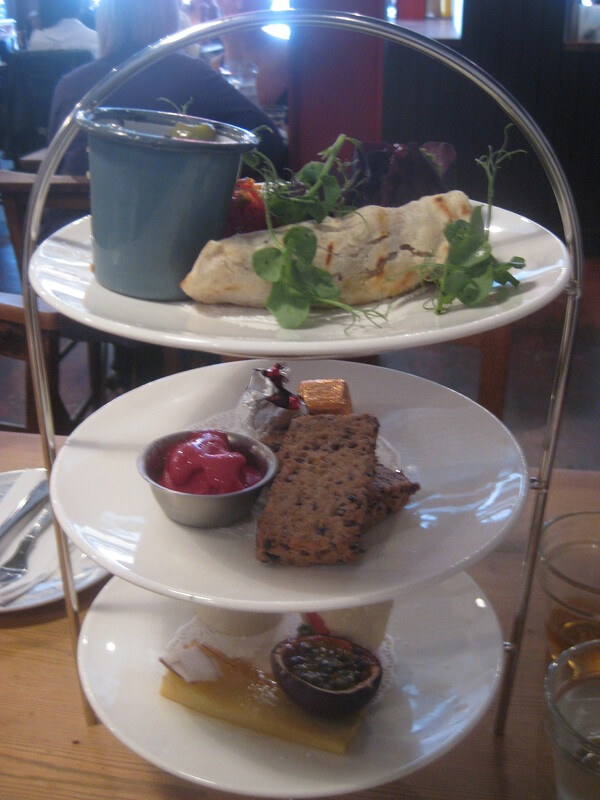 I love the idea of vegan high tea! There’s only one place I know of here in Melbourne that does it, I’m keen to check it out. Strange there was no cake though! And I feel you on the fruit front – I had a gorgeous three course set meal a while back and the place catered for me with advanced notice – the first two courses were great but for dessert I was served some fruit and sorbet while everybody else had beautiful creme brulees with biscuits and sorbet. Ah well, can’t win them all I guess. Ah, I was wondering if afternoon tea existed in other countries too. I’ve had it (non-vegan) in Hong Kong, and vegan in Amsterdam, but I don’t know which other countries would offer it. It’s good that you have at least one option in Melbourne! I would be a bit sad not to find even a little bit of cake in afternoon tea – it’s kind of what you expect isn’t it? Sarnies, cakes, and ideally a scone! Still, at least they managed to whip up something vegan in the first place, which is not to be sniffed at. Hopefully they’ll make improvements in the future! Yeah, the food they served was really nice, it just wasn’t what I’d expected. Anyone catering to vegans is a good thing though, as you say.